With a hefty title comes a hefty dessert. 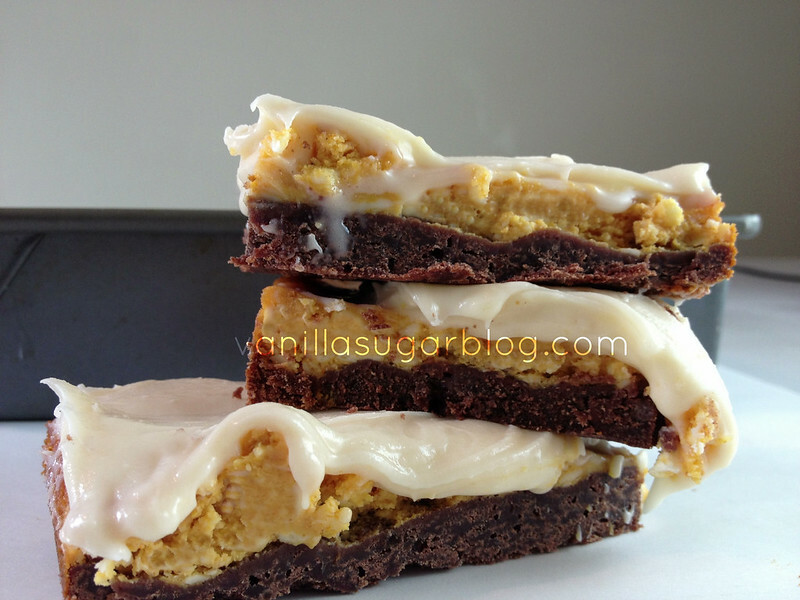 No doubt judging from the photos these bars are rich and delish. 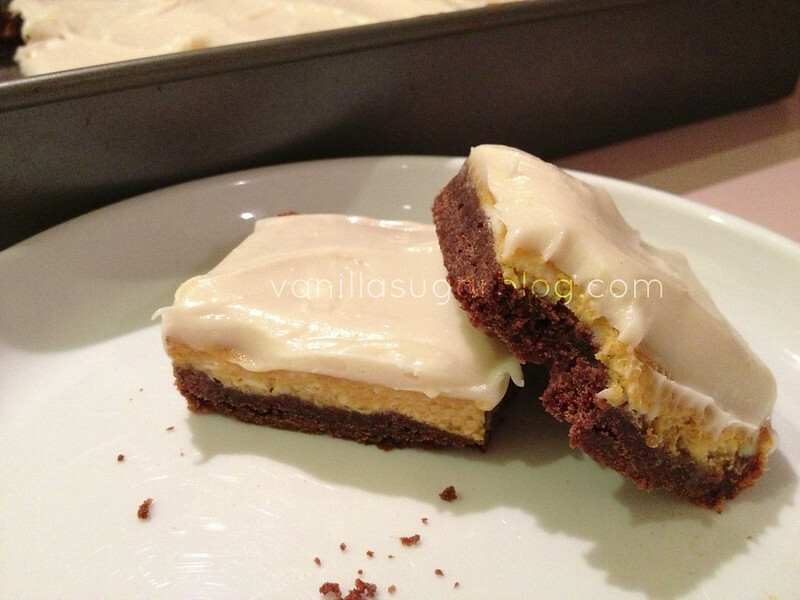 The original bars came from the cookbook Baked Elements and they have a plain vanilla shortbread crust but I wanted to see if a chocolate crust would work and it did. Also since I'm still on my pumpkin butter kick, I wanted to see if using pumpkin butter would work in these and yes it did. Saves a lot of time using a few tablespoons of pumpkin butter than using pumpkin. The original recipe can be found here, and my modifications are below. Not too many steps, the crust is fairly easy to make. All that stuff about baking the crust with pie weights, nah, I'm not into that, I don't have any pie weights and my crust turned out fine. 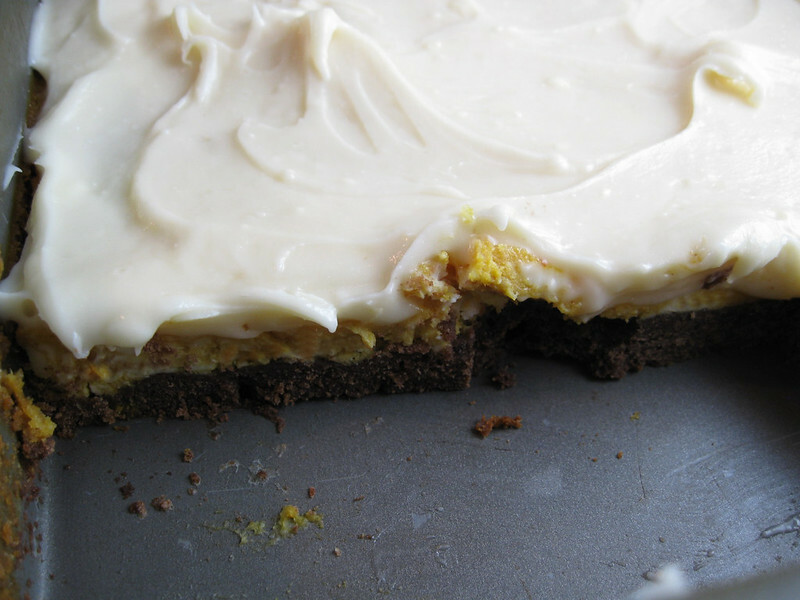 This is a really good frosting base. Tasty. See that wasn't too hard, right? When it all comes together it's really good. Three nice layers of flavor. Makes a lot, so you can share without feeling you will short yourself. LOL! I tease. And congrats to the winners of the G.H. Cretors Popcorn Giveaway! #33 BeeBubba and #70 Lisaiscooking. I'll be emailing you today! Grease the sides of a 9x13-inch baking pan. Line with parchment paper and then grease again. Or do whatever greasing method works for you. For the pastry dough, put the flour, cocoa powder, sugar and salt in the bowl of a food processor. Pulse until combined. Add the butter and pulse a few times, until it resembles coarse sand. In a separate small bowl, whisk the eggs. Add it to the food processor and pulse just until the dough starts to come together. 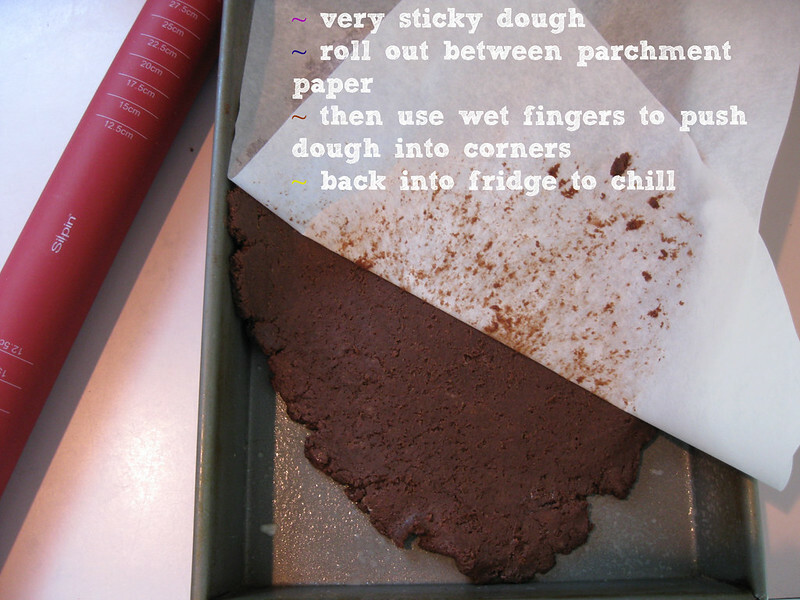 Pat the dough into a disk and wrap it in plastic wrap. Refrigerate for at least an hour or overnight. I did all this by hand, using my hands to incorporate the butter with the flours and then the eggs; worked fine. I also left dough in fridge for 3 days and it was fine. When ready to use dough, roll out the dough between two pieces of parchment paper until it is a bit larger than the pan (9x13-inches). 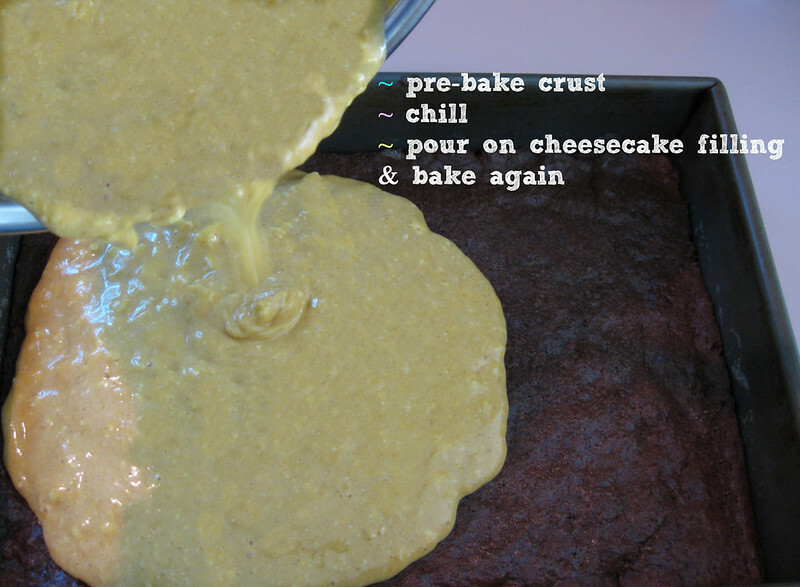 Turn the dough into the pan and lightly press it into the bottom and corners. Trim off any excess. Freeze for 30 minutes. After I rolled out the dough, I used wet fingers to push the dough into the corners. Then back into the freezer to set up again before baking. Line the dough with aluminum foil and fill it with pie weights or dried beans. Bake for 15 minutes. Remove the foil and beans and bake for 10 minutes, or until lightly browned. I don’t have pie weights and this step was NOT necessary at all, my crust came out perfectly. Allow the crust to cool while you make the filling. Reduce the oven to 300. For the pumpkin cheesecake filling, in the bowl of a stand mixer fitted with the paddle attachment, beat the cream cheese on medium until it is smooth. Add the sugar and beat again until combined. Add in the pumpkin, and the pumpkin butter, and mix. Add in the salt, and then the eggs and mix again until nice and smooth. Pour the cheesecake into the prepared crust and bake for 20-27 minutes, or until set and the middle is not runny; a little jiggle is ok.
You must let this cool for at least an hour and it needs to go in the fridge to set up for at least 2 hours. 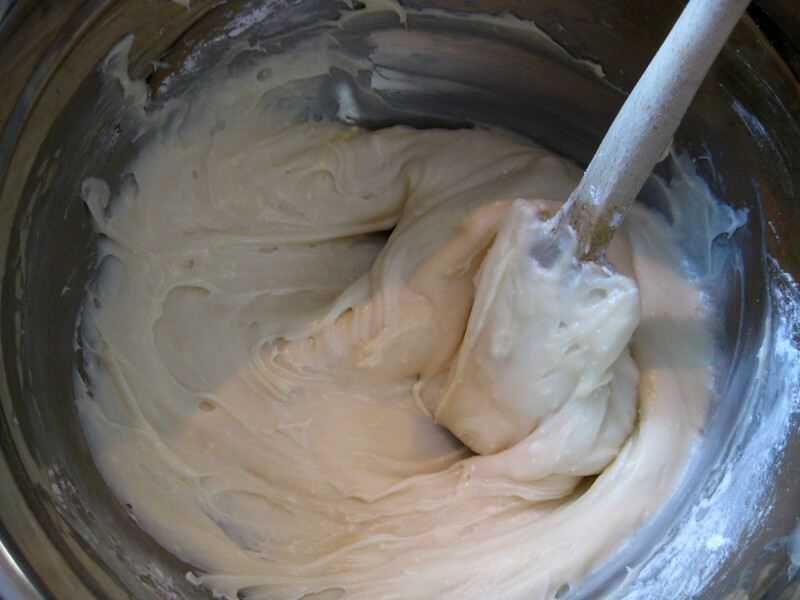 For the cream cheese frosting, in the bowl of a stand mixer fitted with the paddle attachment (I don’t have a mixer so I mixed all this by hand): cream together the butter and cream cheese until well combined and fluffy. Add in the powdered sugar, vanilla, and salt and mix until smooth. 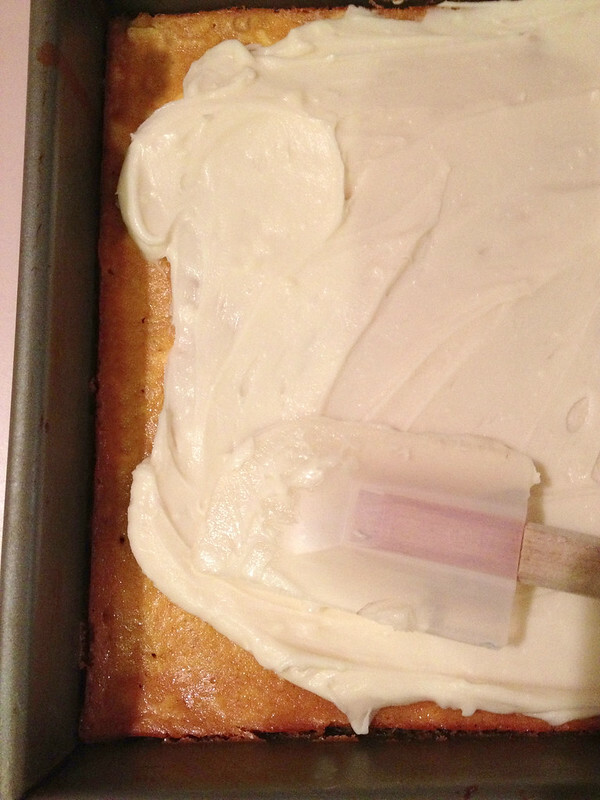 Using an offset spatula spread the frosting over the pumpkin cheesecake filling. Allow to set up in the fridge for 30 minutes before cutting and serving (I skipped this step). Oh, yum! I love the look of the ratio of crust to cheesecake to frosting. Love how nice and thick this crust is. As you said in my comments the other day, skimpy little crust layers with cheesecake just don't cut it! Great layers and flavor/texture diversity in this one! Totally drooling. As usual, when I visit you! Should you feel so inclined to send over a tray of these...I will be quite happy. 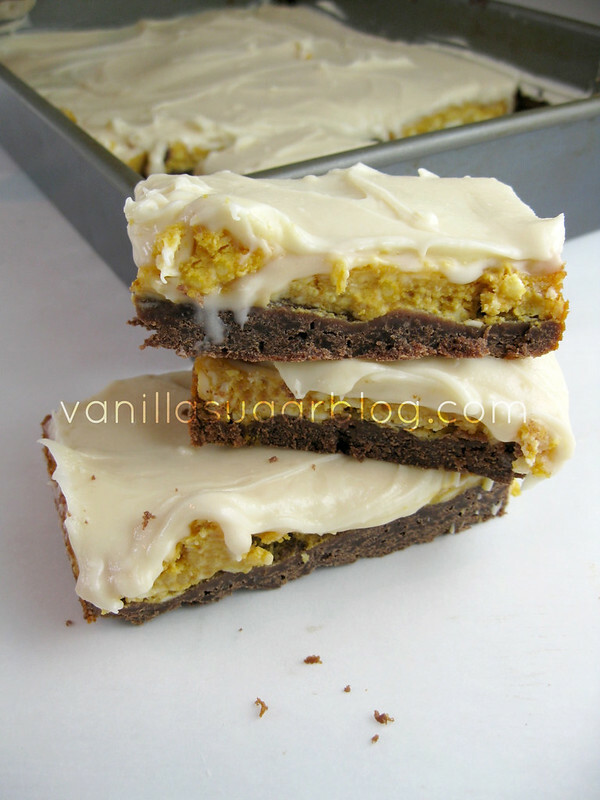 The frosting must add another layer of decadence to these yummy bars! So glad you didn't use pie weights and all that business. Such a waste of time. Oh man. These are my kind of bars. 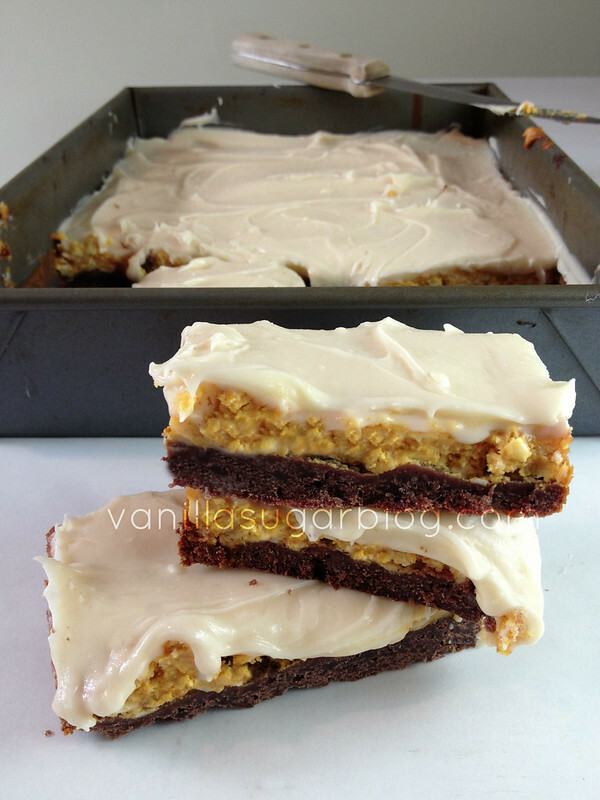 They look fairly simple to make and so decadent and delicious. My kids would absolutely love them!!! Definitely the chocolate crust. Love the look of the three layers though I think I'd love just a taste better! Gorgeous! Those bars look amazing. I've found lately that a chocolate crust goes well with so many flavors! This is particularly amazing! Loving it! All these layers combined spells yummy with a capitol Y.
I must consume them immediately.